Billy Riley and Sheriff Lewis Evangelidis discuss the impact of St. John's Food for the Poor. Manager Bill Riley gives an overview of St. John’s Food for the Poor not-so-typical soup kitchen and food pantry. Fr. John Madden and Bill Riley explain why St. John's Food for the Poor volunteers are so important. 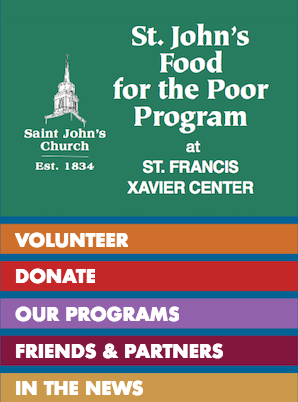 Two volunteers describe their experience serving those in need at St. John's Food for the Poor.